As predicted, Saturday's weather was cold and rainy. 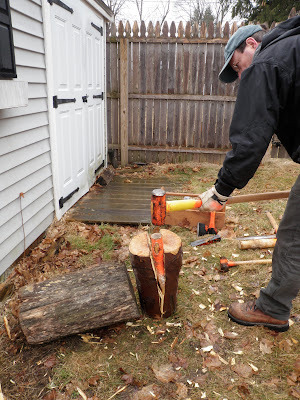 But that didn't stop me from starting work on the applewood logs I'd picked up on Wednesday. I wanted to try several methods of processing them to see how much time and effort they took and how nice the results might be. You may see some things here that make you question my sanity! I'm OK with that. Using the froe and club to score the top edge of the log so the wedge seats more easily in the desired spot. 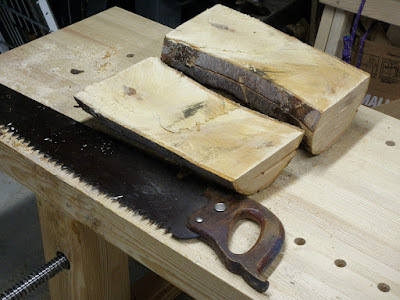 For smaller logs, this may be sufficient to split them. 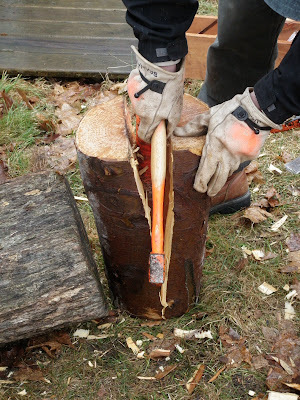 When it comes to riving (controlled splitting), the froe is the precision tool. 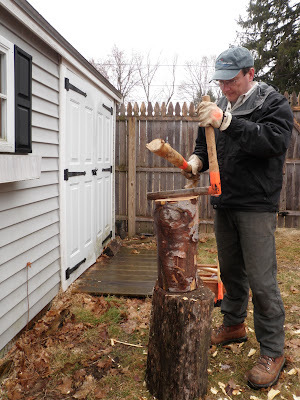 Most of these methods are directly out of Drew Langsner's Green Woodworking and The Chairmaker's Workshop. Both books are out of print, but you can find used copies for outrageous prices. He has some new copies available in the book section of his website. He also sells tools, in particular froes. A lot is also covered in Roy Underhill's spectacular new book, The Woodwright's Guide: Working Wood with Wedge & Edge. Both Drew and Don Weber offer classes in these methods. It was Don's cover story, Entirely By Hand in the April, 2004 issue of Popular Woodworking that sent me down this garden path. But that's another blog story. 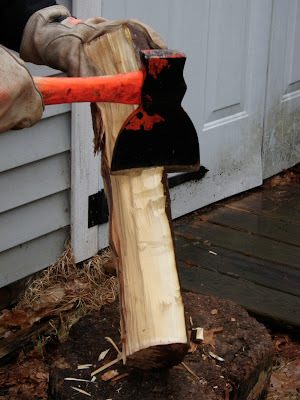 After a couple of blows with the sledge, the wedge is well seated and the crack has already run to the end. In addition to gloves and eye protection, this is a good time to wear work boots, preferably steel-toed. 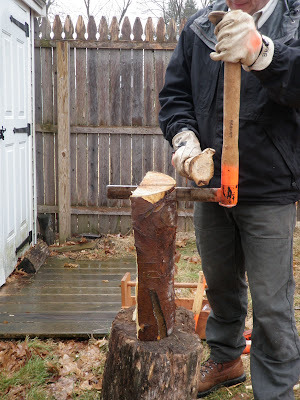 Working with heavy metal implements and chunks of logs, something's bound to fall on your foot. After driving the wedge fully, finishing off with a birch glut (a simple wooden wedge). There are often crossing fibers holding the pieces together that need to be cleaned up with a hatchet. Note that everything is spraypainted orange because they vanish in the leaves as soon as you set them down, especially out in the woods. Quartering the halves using just the froe. Alternate driving on each side of the log. Crank the froe handle over to open the split. Drive further if necessary. Keep your fingers out of partial splits. 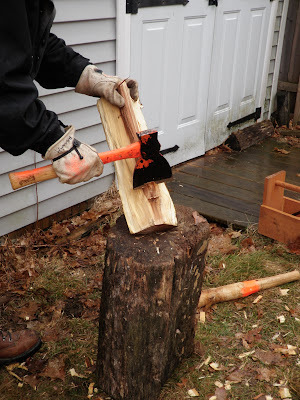 The tension in the wood and cross-fibers has enough power to trap tools and crush fingers, especially in larger logs. Use gluts or additional wedges to open them up wider. 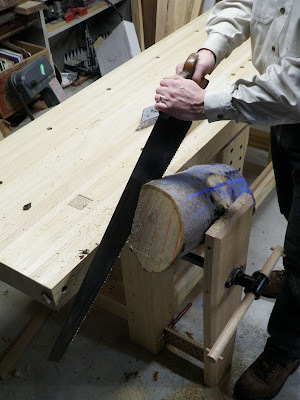 Rough hewing the pith. This is close work, so keep your fingers well clear of the path of the hatchet. Rotate the piece and rough-hew the corners. 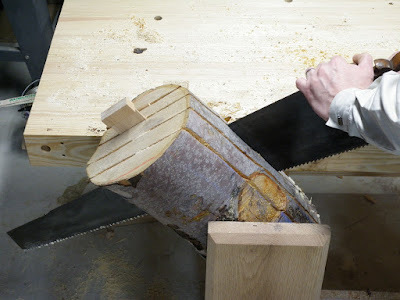 Make a few chopping cuts to weaken the edge, then make a slicing cut to shear it off. Working toward a squared-up billet (the English term for a split section). This billet will end up with a quartersawn orientation, since I'm interested in making blanks for plane bodies. These also make good turning blanks; removing the corners now prepares the blanks for the lathe. Alternatively, you can split to eighths and even sixteenths for smaller parts. 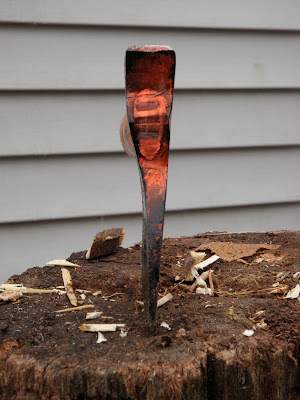 Cross-section of the single-bevel broad hatchet used for hewing. This makes a sweeping cut. Having played in the rain enough, I moved into the workshop. 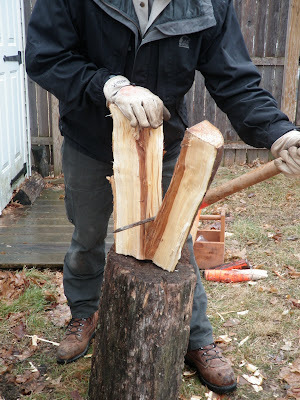 First thing I tried there was flitch-cutting: flat-sawing a log into boards by hand (yes, this is where you say, "Huh? Is he bleepin' crazy?"). Ripping green wood requires large teeth. Digging through my stash of flea-market saws, I found a real gem: a Disston 4 1/2 ppi rip. It needs a little care. After about an hour of the Vintage Saws treatment: scraping the rust and crud, sanding with wet-dry auto-body sandpaper and mineral spirits, waxing, and sharpening. 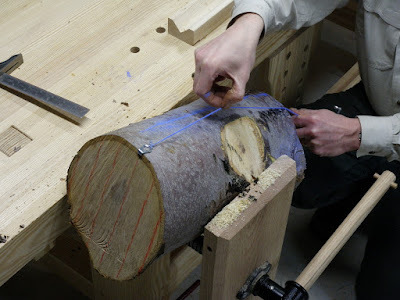 Trimming the log for easier clamping. 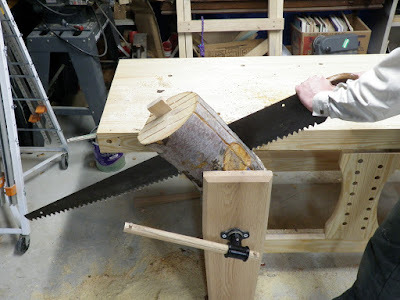 I knew that giant leg vise would come in handy! Snapping chalk-lines after laying out the cuts. Note that the center flitch contains the pith. That can then be cut out, known as boxing the heart, leaving two quartersawn pieces. 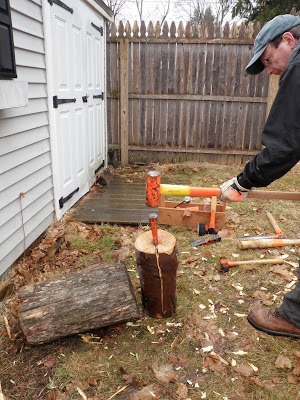 This is how John Whelan obtained quartersawn beech for the planes in his book Making Traditional Wooden Planes. Starting the first cut. This is your typical resawing operation, but heavier. Making good progress. Using an offcut from my Ryoba Tenon Cheeks experiment as a kerf-keeper. The only problem was that this was slow and extremely labor-intensive. I'd like to offer some of this applewood for sale so others can enjoy it, but at this rate I'd have to charge $30 a board-foot to make it worth my while. What I need is bigger teeth! And I have another flea-market gem. Now that's a saw! Look at those rakers and teeth! 48 inches from toe of blade to the horn on the handle. My saw's bigger than your saw! Well, except for Adam Cherubini. He has that enormous four-foot framesaw. Technically, this is a one-man crosscut saw, not a ripping saw, but for this short rip, it's fine. I haven't been able to find a pit saw. That's more like it! 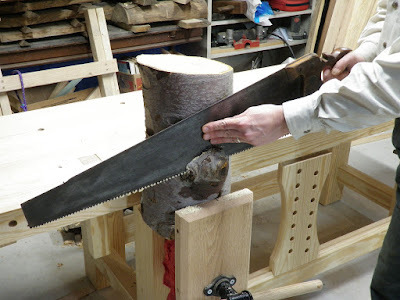 Even without sharpening its teeth, this saw cut at four times the rate of the other one.